Find Double Hung Windows, Single Hung Windows, Double Sliding Window on Industry Directory, Reliable Manufacturer/Supplier/Factory from China. Doorwin is positioned to offer the finest value in quality wood aluminum windows. We seek to make durable, energy efficient and beautiful products accessible to all budgets. We strive to provide the best customer service experience with a dedicated design and engineering team for custom projects and a talented sales team that responds quickly to inquiries. Our energy efficient integrated glazing units (IGU) feature triple-pane glass, warm-edge spacers, argon gas fill, Low-E coatings and fully tempered glass. Different IGUs are available to meet the needs of different climates. For all windows and doors exported to North America, we provide fully heat-treated, tempered glass as standard. This provides extreme impact resistance to prevent glass breakage, reducing warranty claims. When broken, tempered glass uniformly shatters into small pieces for safety. Our standard glazing for the North American market is SGCC (Safety Glazing Certification Council and IGCC (Insulating Glass Certification Council) certified for performance and safety. 1) The flow of energy via thermal conductance. 2) The transmission of light which affects visibility, and the amount of solar heat gain. 3) The transmission of sound. Experts estimate that 70 percent of energy loss occurs in windows and doors and 90 percent of window heat loss occurs through the glass. Triple glazing, low-E coatings, argon gas fill and warm edge spacers can improve the energy efficiency of glazing units by 40 to 50% to deliver maximum insulation, solar heat gain control, condensation resistance and UV protection. Our design team can customize our windows to your unique project requirements. Window dimensions, mullions and muntin are available in unlimited configurations. We can tailor our products for specific applications such as high security, hurricane resistance, extreme sound transmission reduction, UV protection, etc. We will work off your drawings or create our own based on your requirements. After finalizing the order, our design team will prepare a final drawing for client review and acceptance before manufacture. We back up our products with a 10 year warranty for your peace of mind.Contact a Doorwin sales representative to experience what sets us apart from the rest. The tilt-turn window, originating in Europe and popularized by passive-house and net-zero construction, is a window type with the unique characteristic of being both an inward-swing casement style window as well as a top opening hopper style window. The clever hinge and intuitive handle mechanism is specially designed to allow seamless switching between the modes via the orientation of the handle. Depending on the handle position, it can operate as a fixed window (handle in the 6 o'clock position), inward casement window (handle in the 9 o'clock position) or hopper window (handle in the 12 o'clock position). This window style combines the security, air-tightness, egress requirements and ease of cleaning of an inswing casement with the all-weather ventilation convenience of a hopper. This product represents the latest evolution of our tilt-turn window featuring a solid oak frame and sash and exterior aluminum cladding. Solid wood is the preferred choice for windows due to its low thermal conductivity, strength to weight ratio, ease of finishing and appearance. Wood window can last generations, as evidenced by the many historic homes all over the world. That said, wood windows do require regular maintenance and can be susceptible to pests such as termites. Our wood treatment process produces a more durable wood that our internal testing has shown can withstand unprotected, direct exposure to the elements for 10-15 years before failure and can last a lifetime if properly maintained. However, for those that desire the ultimate in window technology, our top of the line wood windows feature exterior aluminum cladding alleviating all concerns with wood and the concomitant design considerations to mitigate them. Competitive with the best in the industry, Doorwin Tilt-turn windows feature 4 sealing layers; a continuous rubber seal around the sash and three inner seals. Along with our pressure-equalized cavity drainage design, this product ensures outstanding performance even under the harshest weather. Doorwin is positioned to offer the finest value in quality tilt-turn windows. We seek to make durable, energy efficient and beautiful products accessible to all budgets. We strive to provide the best customer service experience with a dedicated design and engineering team for custom projects and a talented sales team that responds quickly to inquiries. We back up our products with a 10 year warranty for your peace of mind. Contact a Doorwin sales representative to experience what sets us apart from the rest. 1) A protective film covering the surface of aluminum profiles. 3) Plastic stretch wrap covering the glass. We can handle freight and customs clearance through our shipping partner and can provide door-to-door service if desired. We guarantee that our clients will receive their orders timely and without damage. Our products feature a full 10 year warranty. In the event your order is damaged during shipment or fails after under normal operating conditions we will provide to you at no cost an equal replacement, assuming the defective unit was installed in accordance with our recommended installation methods. It’s International Trading,How Can I protect my Interest or Trust your company? 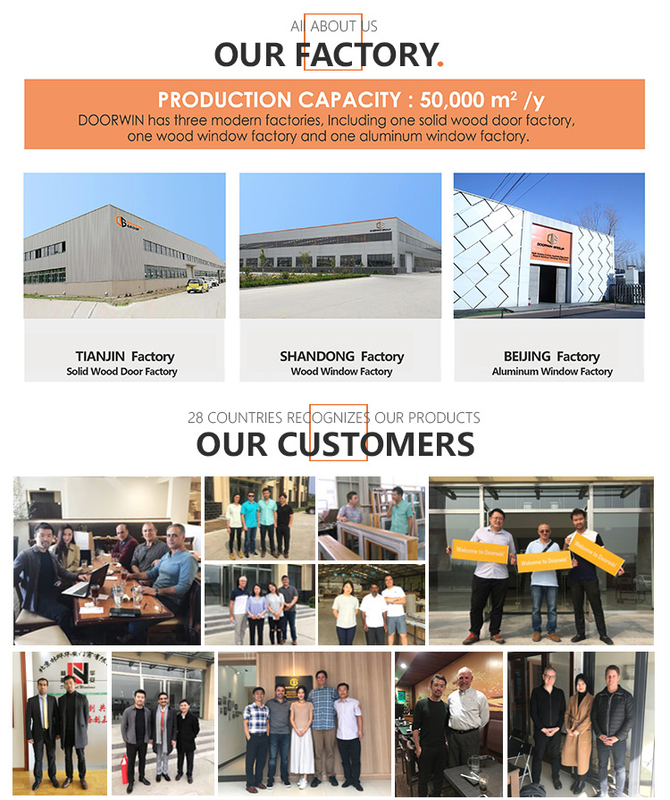 Doorwin is the more than 10 years Gold suppliers on ALIBABA, In additional, our factory are Verified by BV, TUV, NAMI(National Accreditation & Management Institute, which is the basic certificate for windows installed on U.S. Building), Also, this certificate in compliance with North America Construction Standards (AAMA 101/WDMA I.S.2/CSA A440-11, ASTM. NAFS 2011- North American Fenestration Standard/ Specifications for Windows, Doors and Skylights). And now we are waiting for the test results for the SAI GLOBAL certificate. Please contact us ,we can show you more latest exporting documents and records. 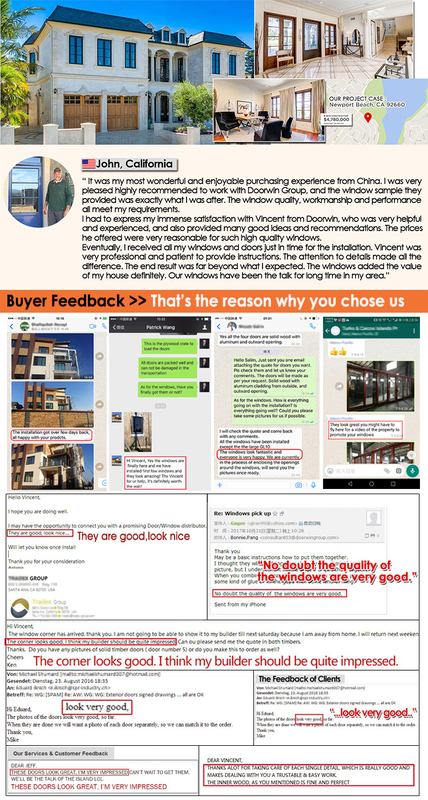 What processes does Doorwin have to maintain quality control? We maintain a quality management system which meets the requirements of ISO 9001 as a minimum and develop, manufacture and check the products according to the rules of this system. We request to sign quality assurance agreement with our material suppliers to ensure the materials quality, in production process self-inspection of each key part from cutting to frame and glass assembling as well as hardware installation must be a formal quality system of our factory. Our QC will inspect the products at regular intervals. Last but not least we will test and inspect the finish products physically before they leave our factory to ensure that the products meet the agreed requirements, specifications, quality and performances. Inspection photos, videos and the records from the in-process controls can be provided for evaluation. Matching with the strict production processing control, every parts of material are picky chosen in high level. The lumber all come from the certificated supplier, and we use Henkel wood adhesive from Germany for the joints to ensure strength and low toxicity. 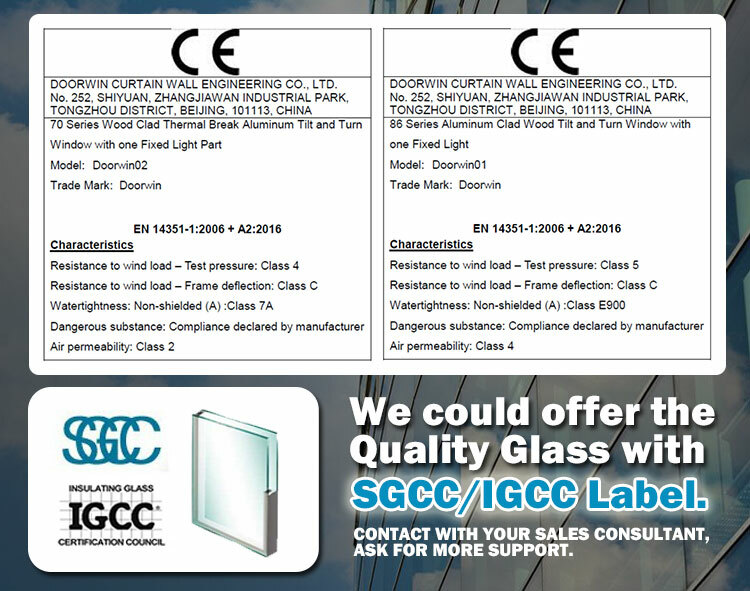 Our standard glazing for the North American market is SGCC (Safety Glazing Certification Council and IGCC (Insulating Glass Certification Council) certified for performance and safety. Hardware Brand imported from Germany and USA such as Roto, Siegenia and Truth fit various Window system. Germany brand Technoform rubber strip for sealing. With those craftsmanship spirit, superior material Doorwin makes *great* windows. While it's good to have a warranty program, what are the specifics? Doorwin is responsible for the quality of the windows and doors supplied and will provide a warranty for a period of Ten (10) years from the date of each shipment, against any manufacturing defects. The warranty is only for the original purchaser and non-transferable. If the customer makes a claim or complaint due to damage or defects in manufacturing, materials or workmanship, photos and videos are required for evaluation. If it has been proven a defective product, Doorwin shall provide the replacement and all the expenses incurred therefrom, including the shipping shall be borne by Doorwin. What will you do if sending me the Wrong windows? 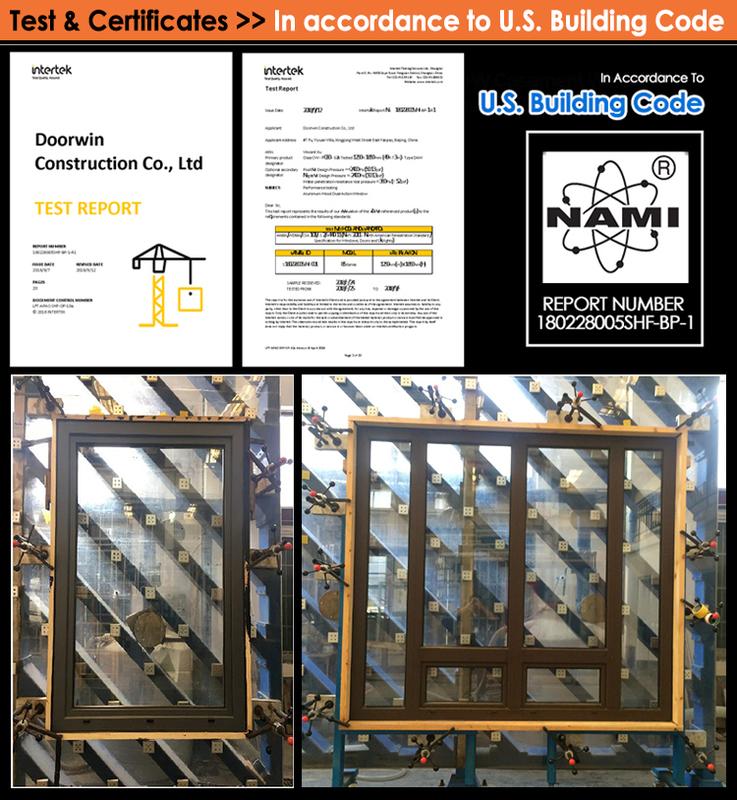 Doorwin will send you the Shop Drawing to confirm the windows Drawing before production. if send you the wrong windows, Doorwin will replace you a new one freely. This is my first time to import windows/Doors, I don’t know how to import? One stop service provides. Doorwin have over 10 years on exporting, we can do the importing for you. Save your time and money both. What are your precise U-factors and SHGC values? Actually, a window’s U-value and SHGC value are determined by many factors, for instance, the window opening styles, frame materials and structure, glass configurations (the number of panes, the type of glass, the type of spacer, the type of gas filled), hardware quality, sealant quality, as well as the rating method, etc. So if customers have special requirements on U-factor and SHGC value, there is no problem for us to achieve by adjusting the frame materials, glass configurations, etc. For example, the U-factor 0.27-0.30 could be reach, even lower. 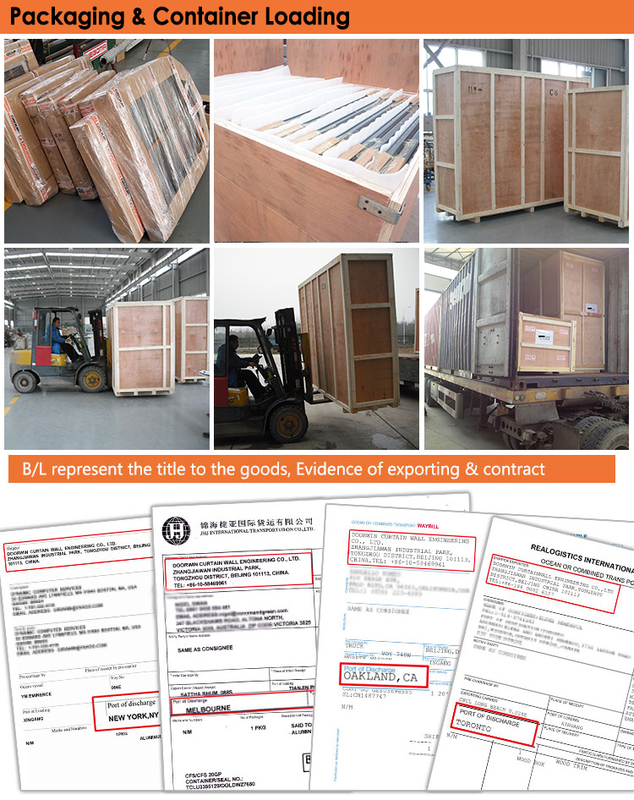 Moreover, the Bureau’s testing report could be available for customer’s necessary need. What are your payment options?What if an order is cancelled? Are deposits refundable? Payment by wire transfer is the most welcome method. The payment term is usually 50% deposit before production, and the balance payment to be made before shipment. Irrevocable Letter of Credit at sight and payment by Credit Card (Visa and Mastercard) are acceptable, while the PayPal is usually for samples payment. If the customer wants to cancel the order, the deposit is refundable after deducting the expenses that have happened. Contact us if you need more details on Aluminum Single Hung Window. We are ready to answer your questions on packaging, logistics, certification or any other aspects about Aluminum Profile Windows and Door、Aluminum Profile Windows. If these products fail to match your need, please contact us and we would like to provide relevant information.